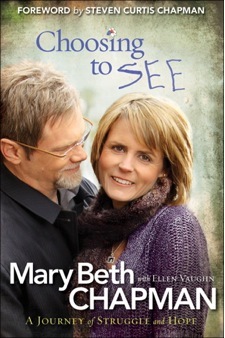 “Choosing to See: A Journey of Struggle and Hope” was written by Mary Beth Chapman, singer Stephen Curtis Chapman’s wife. It's the story of the faithfulness of God in the lives of the Chapman family and Mary Beth’s perspective on the tragedy that occurred when their son accidently hit their little girl in the family’s driveway. Their 6 year old daughter, Maria, died due to the car’s impact. I appreciated Mary Beth’s authenticity about her expectations, relationship with the Lord, and His leading in her (and her family’s) life. The breaking of expectations was a common theme throughout the story and one that really spoke to me. You may be wondering, why. I have had a habit of placing extremely high expectations of myself and the people I care about most. This frequently makes it so that no matter how I act or what others do, it doesn’t measure up to the ideal of how I thought it should happen in the first place. It sets me up for disappointing myself and for others to disappoint me even though didn’t know these expectations existed. It’s as if I have an internal rating system and no one is able to measure up to it. This type of thinking has caused me to spend lots of time worrying about what others think about me and being overly critical of myself and sadly, other people. As I read what Mary Beth wrote, I felt encouraged and challenged to continue allowing the Lord to change this in my own life as I saw His faithful leading in her life story. I couldn’t live up to the expectations that I had for myself…and I knew that God must be disappointed with me too. But Jesus has always loved me enough to show me that even when I push my own ideas and expectations, He is there to guide me back to green pastures. But, true to the way He so often seems to deal with me, God wasn’t running the world—or writing my story—according to my plans. I struggle with these same thoughts, however, the Bible is clear that Jesus paid the price for me when I was His enemy (see Romans 5:8). No matter what I do, He doesn’t love me any less or any more. This truth brings freedom. Mary Beth discussed control in her book and I believe it goes hand in hand with expectations. If I can control the outcome of an event, circumstance, myself or another person, I can ensure the expectations I want happen. Yeah, this is not healthy and it rarely works the way I have envisioned. There is peace when I surrender my life to the Lord and His plans for me. The more I exercise faith in God’s direction, the easier it becomes. He has a perfect plan for all of us. …If I had lived the life I thought I wanted—I know I wouldn’t have experienced the grace or the miracles of God in the ways that I have. If my outlook was dependent on me and how together I was, I’d have no peace. I just had to be willing to give up control and give in to Him, and let Him use this cross in my life. Tragedy, grief, and suffering were a few other themes throughout this book. God’s sovereignty was and is something the Chapman family has experienced firsthand with the death of Maria. The peace of God was a constant reminder of His presence in their lives. In the darkest, loneliest times, in the middle of the night, I realized that Christ is truly all I have. I realized that everything else—everything—is fleeting. God is with me. … He SEES me now. He is with me now. I know this is a simple realization, but it was big good news to me. Jesus, the Son, is always—not sometimes—present. No matter what the circumstance. I know God loves me and my family. I know God is sovereign and He knows what is best for us. I know He has our days numbered and makes no mistakes. …He knows what it is like to suffer! I know that suffering is one place where He ministers to us the most. …may we face each struggle with the hope that He is working out His salvation in us, looking to the day when all things will be made new and suffering ends. …He knows all of my pain, and somehow I am trusting that He alone is the One who is going to fix it, heal it, make it right … when it is time. …Loss and suffering are hard and very unpredictable. I finished reading this book June 16, 2011. This is significant because a few hours later, we found out that some of our family friends (Victor & Crystal) had been in a tragic accident on their honeymoon. I personally, have not suffered significant loss in my life, and hearing the news of our friends was a shock. Because I haven’t suffered, I had always thought I had nothing to offer friends and family during times of suffering. The words of Mary Beth’s story ran through my head as my family conveyed the accident that took place that day. Anthony and I were in Southern California for a family trip and we were able to visit Kevin, Victor’s brother. I know that God had us in So-Cal. Mary Beth wrote that the prayers and the care/presence of their friends and family were the most helpful things for their family during the accident and the grief that occurred (and still occurs). I didn’t have anything “important” to say to Kevin. All we had was ourselves and a belief that God is sovereign. He controls everything. I was so grateful I had finished this book that day, as it gave me the courage to allow hurt and grief to enter my own heart and interact with our friends during their tragedy.